VTA pursues high capacity transit study for Stevens Creek, other corridors; will the study affect budget crisis options? On Friday November 16, the VTA Ad Hoc Financial Sustainability Committee reviewed and recommended options to deal with a $25M deficit. Â Â The CommitteeÂ recommended a lessÂ draconianÂ option that reduced bus and light rail service below the “Next Network” plan, but not lower thanÂ than current service. VTA’s expected budget gap was thankfully halved due toÂ Â Californians’ protection of the SB1 gas tax funding by voting down Prop 6Â and the failure of the lawsuit against the Measure B county transportation sales tax. But the VTA Ad Hoc Financial Sustainability Committee’s proposal did not commit toÂ accelerating improvements that would make VTA service more productive and cost-effective, such as more transit signal priority and all-door boarding.Â Â And the Committee did not commit toÂ revisiting capital spending, including projects that have been on the books for decades and wouldnâ€™t necessarily be high priority if they were considered today. Meanwhile, though, VTA is about to kick off a 2-year study that is revisiting plans for high-capacity transit corridors. Â VTA solicited proposals for the upcoming study with a deadline in September, and is expected to announce the consulting team early next year. The VTA study will explore the potential for high-capacity transit on corridors that have been planned in the past, and that arenâ€™t planned yet, looking at a variety of modes including bus rapid transit, light rail, rapid transit, and heavy rail (diesel multiple unit or electric multiple unit). The study will revisit questions about which corridors are suitable for high-capacity transit,Â considering land use, travel patterns, and potential speed. If a corridor isnâ€™t currently suitable for high-capacity transit, the study will identify changes that could support such investment. The Stevens Creek corridor is of particular interest, as seen recently in proposals for the MTC Horizons transformative projects competition. Â VTA, and the cities of San Jose, Cupertino, Santa Clara jointly submitted a project for â€œStevens Creek Rapid Transit Line for a high speed, high capacity, grade separated system from the Diridon Station area to De Anza College along the West San Carlos-Stevens Creek Corridor.”Â Â While Stevens Creek wasnâ€™t chosen for evaluation by MTC, it was already included in the scope of upcoming VTA study. The updated High Capacity Corridors study seems like a good process to provide a rational update to consider long-standing plansÂ in the context of currentÂ conditions, without appearing to pick on any particular project on the books that may have outlived its original justification, and without appearing to pick on the hopeful aspirations of local officials who are eager for rapid transit that might not be justified by land use and likely ridership. 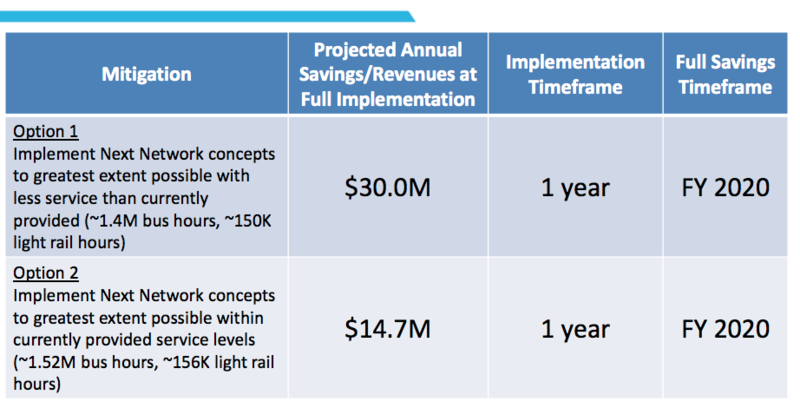 Can the High Capacity Corridors study help VTA address its financial crisis? The options on the table on Friday only included different scenarios to reduce bus and light rail service hours. There were no options on the table to defer or reconsider legacy capital projects. Â Changing a legacy capital project that was approved by the votes is politically fraught. But cutting service that voters agreed to pay for is also problematic. And, going ahead to build out legacy capital projects with questionable ridership potential, while the agency canâ€™t affordÂ growÂ current service at pace with population, might be compounding problems into the future. The request for proposals identified the following â€œlegacy corridorsâ€ for updated consideration, noting that they werenâ€™t in any particular order. The VTA board is expected to make decisions about responses to the financial crisis at its board meeting on Thursday, December 6. Another study? The VTA did a study in 2009 evaluating potential Bus Rapid Transit corridors and arrived at its conclusions: El Camino/Alum Rock, and Stevens Creek are the most suitable. Since then all have are nicer buses on the 522 and a little under 2 miles of dedicated lanes in East San Jose. Have those initial study conditions fundamentally changed? Stevens Creek light rail always made sense to me given Santana Row and other businesses there. Same with El Camino. How about BART down the Stevens Creek corridor with stations at Valley Fair/Santana Row, The Spaceship and De Anza with a Permanente Quarry maintenance facility?